Convenient, accessible storage areas create an environment in which people with disabilities—as well as those without—can contribute to their full potential. Making storage facilities accessible benefits not only people who are permanently disabled as well as those who are temporarily disabled because of an accident or illness. No matter what the situation, our #1 priority is making sure it’s easy for users of a particular storage system to get what they need, ensuring their time spent working and collaborating is productive. Meeting a building’s compliance for the Americans with Disabilities Act (ADA) is easily achieved with Spacesaver’s mobile storage systems. The systems feature storage units mounted on wheeled carriages that run on tracks in or on top of the floor, depending on the system used. 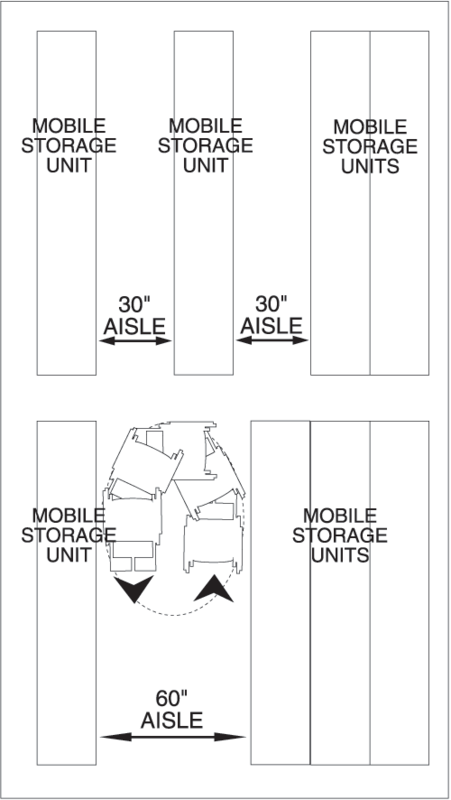 Rather than having to allow for an access-width aisle between each storage unit, mobile systems create an aisle wherever an operator needs access, and are compacted to create the accessible aisle by one of four methods – manual assist, mechanical assist, powered touchpad control, and an LCD touchscreen control. The powered touchpad control and the LCD touchscreen are the most accessible, and will offer programming flexibility and additional safety features. Increase accessibility—items in mobile storage are easily seen and/or felt and can be retrieved quickly. In case of an emergency, safety devices will stop moving high-density mobile carriages. Stop buttons are easily accessible and clearly marked, and systems equipped with a Zero Force Sensor® system prevent carriage movement when someone is in an aisle and similarly, will stop carriage movement when a person enters a closing aisle. Aisles: There are minimum widths that must be considered for aisles as well as continuous clearances for wheelchairs. In library settings, a wider aisle above the minimum is preferred. Mobile storage can provide the wide aisle in much less overall space than stationary shelving, which has to provide the space between each unit. Wheelchair Accessibility: Minimum standards are needed—which can change depending on if space is needed for wheelchair turning (180 degrees) or if a t-shaped space is required for the backing up and turning of the wheelchair. This must be determined on an individual basis, depending on the physical limitations of the facility and the person(s) using the storage system. Dual-Access Aisles: Providing access on either end of an aisle may eliminate the need to a turnaround, as people using wheelchairs can simply enter on one end of the aisle and exist through the other end. Turnaround Aisles: In a mobile system, allowing for a 60-inch aisle for wheelchair turnaround can also create two 30-inch aisles for people not using wheelchairs, and a powered mobile system, can be set to lock with a carriage, making it a stationary platform with an aisle on either side. Floor Surfaces: These include ramps and aisle floor services in addition to regular flooring, which need to be firm and slip-resistant. Ramps: Ramps are required when there is a change in levels greater than ½”. Our storage team will calculate ramp requirements for each application. Opening Force: Unless a wheelchair is locked, pushing a carriage will exert an equal force that pushes the chair away from the system. For this reason, a powered mobile storage system is the best option, as carriages are easily moved by someone with a touch of a button—and a remote control device can even offer added convenience. 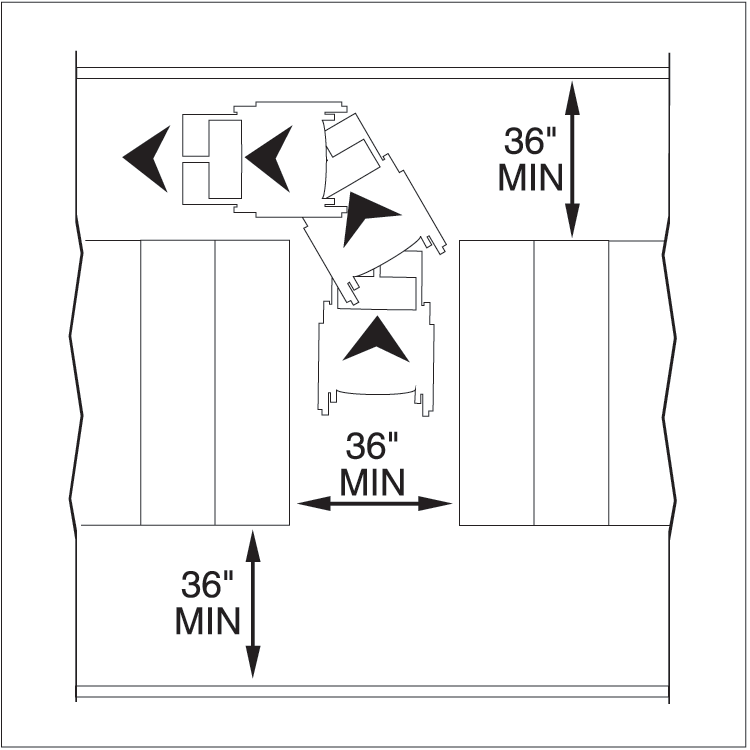 For example, Spacesaver’s powered mobile systems are at a height of 44”. Type of Controls & Control Height: Similar to elevator buttons, there is a range of high from the floor (35”-48”) that is advised for mobile systems. Touch or U-shaped pulls for doors are what our team recommends for manual systems, although we do advise using powered controls, which are the easiest to operate and ensure access to people with almost every type of disability. Signage: Signage on mobile systems designed for access to people with disabilities need to include instructions for operating the systems as well as the contents of the carriages. For more information about systems such as library racks, magazine displays, height and reach limits, and more, please download our Achieving ADA Compliance With Mobile Storage brochure, which talks about these considerations and options for compliance in more details.